The Sagrada Familia, (Holy Family), is the symbol par excellence of the Catalan capital and in reality, can be viewed as one of the most symbolic buildings in the whole of Spain. This is one of the world's most famous uncompleted works which is always different on every visit. It often happens that one visits this building a few years apart but it can also happen that some visitors will revisit the basilica just a few months apart and will still discover new parts of the Basilica as well as new features in the vast museum inside it. Five generations have been involved in the construction of La Sagrada Familia and, as with the generations to come, it is already thought (and hoped) that the project will finally reach completion in 2030. In other words, for several years to come, those who choose to visit this iconic building will still be able to see it with its cranes in view and certain areas that remain closed as construction work is still on-going. If in some ways this is viewed as a pity because it can spoil your photos, at the same time, it is one of the things that characterises the building. Therefore, one morning, when the work has finally been completed, we will be able to say that we have seen the building grow throughout its journey to fruition. Everyone knows that behind the history of the Sagrada Familia, is the hidden artistic genius, Antoni Gaudí: but not everyone knows that the construction of the basilica actually started in 1882 and thus, was not originally designed by the great architect. In fact, the first stone was laid on the feast of San José on the 19th March, 1892 and the architect was Francisco de Paula del Villar y Lozano. After a short period of time, this architect abandoned his neo-gothic project and relieved himself of all responsibility for it, leaving the project in the hands of a young but already famous architect, Antoni Gaudí. Gaudí's project was based on the idea of a vast church that would be hugely symbolic, in which all travellers could learn the teachings of the Gospel. In 1894, the apse and the facade of the Nativity were completed. On the other hand, the Rosary door (one of the doors on the side of this facade) had to wait a further five years before completion. The work projected the construction of three facades, starting with the facade of the Nativity, as much for practical reasons as for the symbolic significance of birth and therefore, of the creation. Gaudí himself gave the best explanation with the following words: "If, instead of starting with this decorative, ornamental and declamatory facade, we had started with The Passion which is hard, bare and made as if from bones, people would have walked away." Actually, luckily for us, it is now also possible to view the Passion facade which was finished after the death of the famous architect. 1909 was another important date in the construction of the basilica. Gaudí was a man who was conscious both of the nature of the setting and of the workers and so, he set up a small temporary school for the workers' children. In actual fact, the school was not that temporary as it can still be seen today and it is lovely to witness how this idea came to fruition with the use of local bricks and thoughtfulness for the good of these children which resulted in a building that was as beautiful as it was functional for the purposes of learning. In 1914, the architect's profound passion and total involvement in the work led him to move his home right inside the offices of the Sagrada Familia. During this period, the work continued at a vey slow pace and it wasn't until 1925 that the first tower of the facade of the Nativity which was dedicated to St. Barnaby could be seen and this was one of the only towers that the architect got to see finished because only one year later he suffered an accident in which he lost his life. This is the history of the Sagrada Familia, or at least its history up until the untimely death of its creator. In fact, the projects that were started by Gaudí are still carrying on today and it is hoped that his dream will be realised in its entirety by 2030. In reality, we have all known this as a building that is still under construction, with its cranes still in view which, on the one hand may be seen as an eyesore in our photos but on the other hand, make us participants in this wonderfully ambitious work which is still in the process of construction. As you enter the interior of the Sagrada Familia, you will notice how people are looking upwards as they walk, intrigued by the shapes and sensational sculptures. Above all, your eyes will be drawn by the mesmerising play of lights and colours which could only have been created by the unique mind of someone who was profoundly in touch with nature, Antoni Gaudí. In fact, almost all the light inside the Basilica is natural light which filters through the majestic multi-coloured glass windows. Every aspect has been considered down to the minutest detail and you can just imagine that as the sunlight comes into being, it penetrates through the facade of the Nativity, emphasising anew the great joy engendered by the birth of Christ the Saviour. The structure itself continually evokes the themes of Christianity and to really understand this, it is strongly recommended that you visit the basilica with a local guide who will be able to share all the idiosyncracies and exquisite details of this magical building. On this website you can book a guide who speaks your language and you can also choose the time and date of your visit. Every aspect of this iconic basilica, down to the smallest detail, carries a profound and sometimes hidden significance. 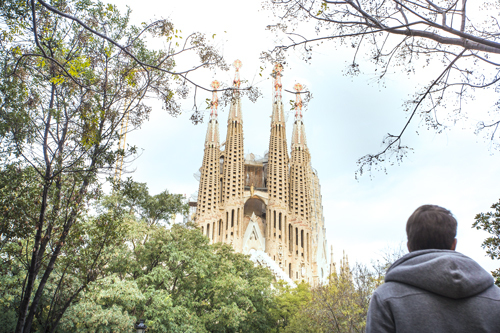 Visiting the Sagrada Familia accompanied by a local guide who speaks your language will enable you to admire some of the details which, without this intimate knowledge, you could easily overlook. A lot of visitors, fascinated by the magnificence of the wrought iron doors, are unaware of the small and utterly precious details contained in the workmanship such as the elaboration of the tiny insects that are present in the facade of the Nativity. The project that is the Sagrada Familia incorporates three facades, two of which are already finished, the Facade of the Passion, the Facade of the Nativity and the Glory Facade, the last of which is still unfinished. The Facade of the Nativity which is dedicated to the birth of Jesus Christ is the only one that Gaudí had the honour of designing and which he saw finished. The Facade of the Passion is the work of Josep Maria Subirachs and is dedicated to the passion of Our Lord Jesus Christ and is situated on the west side of the basilica. The Sagrada Familia remains open to visitors throughout the year from 09:00 in the morning until 19:00 except during Christmas when the doors close at 14:00. In addition to this, out of respect for those who are paticipating in a religious ceremony, during Mass it is not possible to visit the interior of the basilica either alone or with a guide. The church isn't located in the historic centre of the city, however, it is still reasonably central. In order to get to the Sagrada Familia, there are different metro lines you can use, (the Violet L2 or the Blue L5 getting off at the stop of the same name) and different bus routes, (numbers 19, 33, 34, 43, 44, 50, 51, B20 and B24). Entry tickets cost from €15.00 per adult (depending on the type of ticket selected). You can buy your tickets at the ticket office at the entry to the basilica but you need to bear in mind that you are likely to have to queue for at least an hour and then, after this long wait, entry is not necessarily guaranteed. In fact, the security policy at the Sagrada Familia is very strict and if the number of permitted entries has been reached, it will be necessary to return in the next free slot. For this reason, our advice is to book your tickets in advance. This will ensure that you are definitely going to get in at the time you want and the "Skip the Queue" feature is included in the price. Buy your entry tickets for the Sagrada Familia now.